He said that our country will be boosted by the strong fundamentals, abundance of natural resources, favorable demographics and resilient economic structure. He further added that our economy over the years has moved from agro-based to knowledge driven. He said, “With great pride, I can say that no multinational company can afford to be absent from India because of its enormous intellectual man power. A total of 1620 students were awarded the Degrees out of which 10 students were awarded Gold Medals by Shri G M Rao, the group Chairman of GMR. In addition, 33 Silver medals were awarded to meritorious students in different courses. Cairn Laureate Scholarship was awarded to Aamir Lokhandwal and Shivam Saxena. L&T Scholarship was awarded to Lakshmi Narsiman B and Siddharth G.
In addition, under the Centre for Continuing Education (CCE), PhD degrees were also awarded. 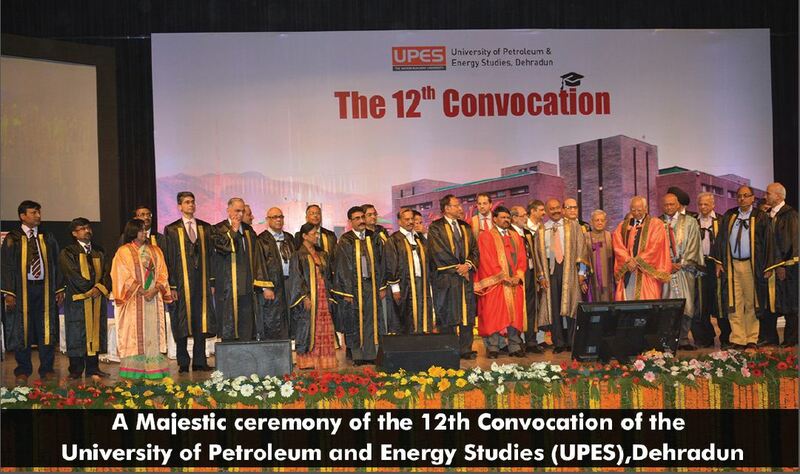 A total of 16 PhD degrees were awarded to working professionals and faculty/ staff of UPES. UGC approved and NAAC accredited, UPES offers more than 77 graduate and postgraduate programs to more than 6200 students in the high growth sectors of Oil & Gas, Power, Aviation, Shipping, Automobile, Infrastructure, Electronics, IT, IB and Logistics & Supply Chain. Being innovative and domain focused in approach, UPES is India's and Pan Asia's first Energy & Core Sector University. From this academic session, UPES has launched 24 new programs which include multi-disciplinary programs like B. Des, B. Plan, BFA under two new Schools called School of Design Studies and School of Planning & Architecture respectively.